Have any problem? please email to Simolio Support: support1@simolio.com. We are confident to get one good solution for you. 1.Pls check IR sensor frequencies of your car DVD players and make sure they are universal before purchasing. (consult your DVD's manual or manufacturer. Universal IR frequencies: Channel A: L/2.3MHZ,R/2.8MHZ; Channel B: L/3.2MHZ,R/3.8MHZ). If you DVDs are non-universal, it will cause no sound, audio cuts, only hear at one side. 2.The Simolio IR wireless headphones are the perfect traveling companion for the family on the go! Compatible with all universal car DVD Players.They can also be used outside the car with the included Aux cable for smart phones, Tablets, MP3 etc, or equipped with an IR transmitter for watching TV at home. 3.Pls use 2*AAA premium alkaline batteries. Not suggest to use rechargeable Ni-MH battery. Revolving clasp battery cover, rotate clockwise to lock it, or it won't stay latched. 4.Pls pay attention to the IR transmitting angle and distance. Sound will be cracking if too far away, or not in sight of IR transmitter, which is limitation of the IR system type, not the product itself. The best audio signal will be obtained if you sit directly in front of the monitor within 6 feet.If you sit on either side of the monitor you can expect the same great reception within 35 degrees to the left or the right of the monitor. 5.There are 2 channels option for the Simolio IR headphones. Set each DVD on a different channel, and the headphone to the channel of the DVD you would like to listen to. 6.For the toddler or someone who feel the headphone is too big, we suggest to use the included detachable & adjustable headbands to fit you better (Ref. FIG 4). The headband incorporates memory elastic stainless steel strips inside, you can remould the headband shape to fit you better,or adjust the wearing angle to make the headphones fit snug on your ears. Foldable Universal Car Kids headphones: compatible with most car DVD systems. (universal IR frequencies: CH A: L/2.3MHz,R/2.8MHz; CH B: L/3.2MHz,R/3.8MHz). If your DVDs' IR frequencies are non-universal, you will need to buy the original headphones. Wireless IR Headset: it is not only a perfect traveling companion for a family car trip, but also can be used with IR transmitter (not included) to enjoy late night TV shows without disturbing your family or kids can leave you a peaceful space by using it to watch their favourite cartoons or play games. If your car DVD has not a built-in infrared transmitter or you want to use these IR headphones for TV watching at home, we suggest to buy our Simolio IR Transmitter for better performance. 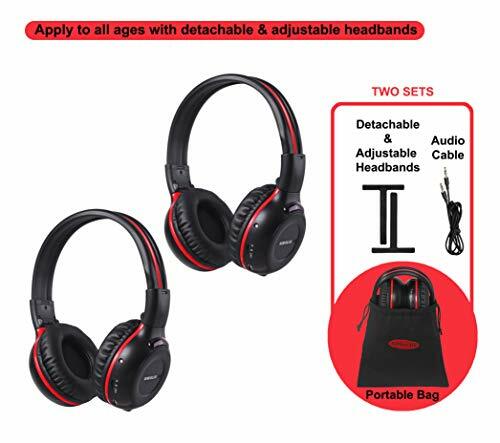 Two Channel Wireless IR Headphones: for two kids at the same row watching different movies from the headrest DVD players without interference by switching to A/B channel. If you installed a ceiling/roof mounted DVD player for all the people in different rows to watch the same program, we suggest you to choose channel A for both your DVD and headphone which may have better performance than channel B.
Over/On Ear Car Headphone with Detachable & Adjustable Headbands: the headphone's sizes are shown as FIG 4. Please measure the sizes of your kids' heads and ears before ordering. For the toddler or someone who feel the headphone is too big, we suggest to use the included detachable & adjustable headbands to fit you better (Ref. FIG 4). Also the headband incorporates memory stainless steel strips inside, you can adjust it's shape or wearing angle to make your kids more comfortable. (Ref. FIG 5). Power Saving Vehicle Headphones with Custom Bag for Easy Storage: 2 New AAA batteries (not included) can provide up to 20 hours of continuous working time. Automatic shut off prevents batteries from draining when left on to ensure maximum battery life. 3.5mm Aux jack with Aux cable included, for use with iPad, iPhone and Tablet PC etc. If you have any questions about this product by SIMOLIO, contact us by completing and submitting the form below. If you are looking for a specif part number, please include it with your message.